Manchester United legend, Sir Alex Ferguson was spotted in the crowd watching the Champions League game between Roma and Barcelona at the Stadio Olimpico. Metro believe the former United manager was on a scouting mission for the club. Reports in the past few weeks have suggested that The Red Devils will be open to the possibility of shelling out £54m for the services of French central defender, Samuel Umtiti. The 24-year-old left-footed defender is stalling on signing a new deal at the Camp Nou, which has alerted a host of top European clubs who will be looking to activate his release clause. The football world was shocked after Roma defeated Barcelona 3-0 to qualify for the semifinals, a game that Umtiti didn’t cover himself in glory. Sir Alex Ferguson was believed to be scouting the player, with a view to convincing him to swap Spain for England this summer. Manchester United boss, Jose Mourinho wants the signing of the former Lyon man to bolster his defence as he believes a central defensive partnership of Umtiti and Bailly will elevate United to a new level of defensive solidity. Discussions about a contract between Umtiti and Barcelona have stalled in recent months as the club are not willing to grant him a huge wage increase. Since his arrival at the club in 2016, Umtiti has become one of the first names on the teamsheet, offering a calming presence at the back alongside club legend, Gérard Pique. Umtiti wants to be recognized for his performances this term and believes he should be earning closer to the likes of Suarez, Messi and Coutinho. 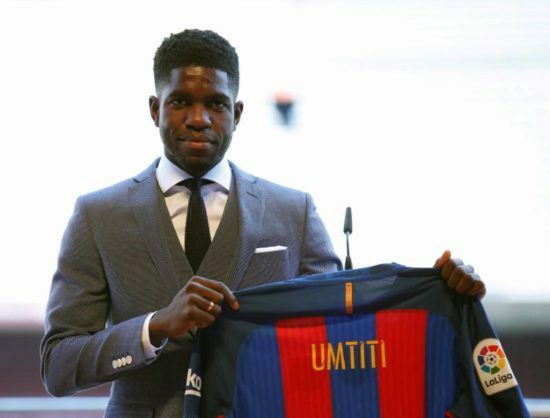 Umtiti is a classy central defender known for his calmness in possession and ice-cool defensive prowess in spite of pressure from the opposition.